In which we meet the arch-baddies for the first time, and everyone forgets about Cally. Episode in a word: Hugbot. Characters to cheer: Supreme Commander Servalan, portrayed by the brilliant Jacqueline Pearce, is fantastic from her very first line. The scene a bit later where she first flirts then pulls rank on Rai sums up the character. And Travis - complete with eye-patch - is so charismatic, as portrayed by Stephen Grief. Such a wonderful pair of villains, who add so much to the series. Characters to boo: Blake, Avon, Gan, Vila and Jenna. There’s a sixth humanoid member of the crew. Remember her? Obviously not. Recognisable Face: The wonderful Peter Miles (Rontane) made a career out of playing bad-guy roles. He’s perhaps best-known as Nyder in the classic Doctor Who serial Genesis Of The Daleks, where he was the loyal henchmen to evil Dalek creator Davros. Ladies, try to find a man who looks at you the way Vila looks at a gate marked "Top Security." Blake decided to give Travis a big Valentine's Day hug. Brilliant, Hugbot! Nearly spilled my tea laughing! That was a laugh out loud monent. Brilliant! Score one for the Hugbot! And to finally meet a hugbot is exciting! Obligatory response: "Is that a gun or ...?" I won't be around for this tonight, but I hope Soolin is looking lovely that they don't forget about poor Cally this time around. We'll miss you. Also, if Soolin were in the landing party she wouldn't have forgotten about Cally! A good episode as an intro for Servalan & Travis the arch baddies. 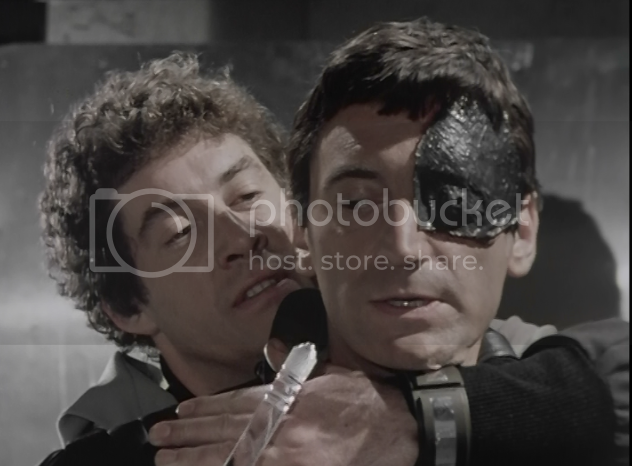 Also a fast moving action/adventure type episode which I like, and the idea of Blake lying in wait for Travis is clever. On the negative side Vila telling the Fed security guards that he is a terrorist come to blow up the base is a bit silly, and the Security Robot looks cheap. Ooh you can't be mean about the hugbot! You'll get in trouble. It should be my 19th wedding anniversary today. Also why does it take Blake so long to realise Cally is AWOL? That always annoys me. Compare and contrast to Deliverance where they realise Jenna is missing straight away. Maybe lessons were learned after losing Cally. Or maybe they just care more about Jenna? Hello, hoping to join for this. I have been in awful pain with my back and leg since this afternoon so this should be a welcome distraction!